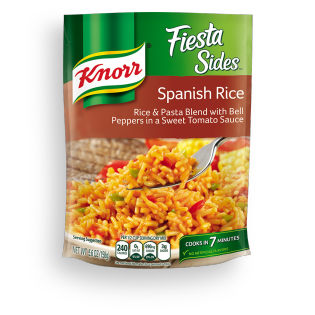 It’s easy to spice things up with our Spanish Rice Fiesta Sides, thanks to its peppers, onions, tomatoes, garlic and sweet tomato sauce. No need to wait for dinner — try it at breakfast with our Chorizo and Egg Rice Bowl recipe. Spanish Rice is rated 4.3 out of 5 by 151. Rated 5 out of 5 by lkaw1954 from Jambalaya I use this for my version of jambalaya. I saute fresh vegetables in olive oil-fresh peppers, sometimes sugar snap peas and green onions too. I also add a dash of Old Bay seasoning. Remove them from the oil , add in cut up all beef sausage until brown, remove and drain a bit on paper towel. Then I add the rice mix and water, following package directions. Halfway through I had the meat and vegetables back to the pan and finish. I've also added cooked chicken breast and shrimp too. It depends on what I have on hand. Rated 1 out of 5 by dopp from Package label should read "SPANISH RICE & PASTA" Bought this thinking I was getting Spanish Rice and it turned out to be a rice/pasta mix. Would be better to plainly label the box as "SPANISH RICE & PASTA" in the largest text. Never even heard of mixing rice and pasta in the same side dish. Tasted odd and the Spanish flavors were way too subtle. Rated 5 out of 5 by Kingquad700 from Makes for an easy tasty meal I picked up some extra packages when it was on sale. I looked at the recipe on the back of the Spanish rice package and thought "that might be a good idea for my semi-picky daughter. So I made it tonight and she said she liked it. But the real story is how she cleaned her plate without much talking.